• Honest upfront pricing – you’ll always know the price before we start the job. • Honest Advertising – No bait and switch here. • Knowledgeable and Trustworthy Professionals – We wouldn’t send anyone to your home that we wouldn’t trust in ours. • We leave no mess to your home. 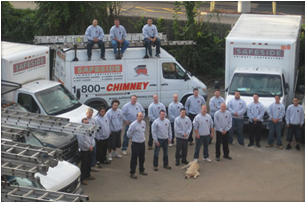 • We promise honest and objective evaluations of your chimney projects. The chimney will tell us what it needs or doesn’t need. Safeside Chimney promises customer satisfaction. Should any questions arise before or after the job you may contact any member of our management team who are assembled to serve you. Call us at 1-800-707-9337 8am-8pm with any questions. It is our intent to create a happy lifelong loyal client who shares their experience with their friends and family for mutual benefit. • We will serve you honestly, ethically, competently and objectively. • We stand by the work we perform. We will not compromise the integrity of our profession. • We will always maintain a professional attitude of proper behavior toward you. • We will perform our duties with the respect and kindness you and your home expect and deserve. If we ever fall short of the above please contact me, Kevin Beary, Vice President and I will do what is necessary to make things right. Be on the Safeside with Safeside Chimney!